Cryo-planing (also called cryo-facing) provides a unique 3D view of internal and surface features by cutting a cross-section through frozen tissue or frozen material specimens. Using an mPrep Workstation and mPrep/s capsules, plant and animal tissues were cryo-planed with an ordinary cryo-ultramicrotome, thus using common equipment to provide facile control of the cross-section location. mPrep/s capsules held and oriented specimens throughout all protocol steps: rapid freezing, cryo-planing, freeze-drying, mounting on stubs, conductive coating, and room temperature SEM imaging. This required no custom apparatus or expensive cryo-SEM instrumentation. However, the specimen handling method could be adapted for cryo-transfer and cryo-SEM imaging. In this study of Pseudomonas aeruginosa lung infections, Lillihoj and co-authors used an mPrep ASP-1000 to perform automated immunogold labeling of MUC1-ED receptors on Pseudomonas aeruginosa bacteria adherent to Pioloform-coated grids. The automated ASP-1000 protocol included a dozen sequential reagent steps over ~12-hours which included primary labeling of MUC1-ED receptors with anti-MUC1-ED antibodies (or control antibodies) followed by 10 nm gold labels conjugated to goat-anti mouse IgG secondary antibodies. Automated immunogold labeling of receptors on Pseudomonas aeruginosa bacteria adherent to filmed grids. Blancett CD, Fetterer DP, Koistinen KA, Morazzani EM, Monninger MK, Piper AE, Kuehl KA, Kearney BJ, Norris SL, Rossi CA, Glass PJ, Sun MG. (2018) Scanning Transmission Electron Microscopy (STEM) for Accurate Virus Quantification. Defense Technical Information Center, United States Department of Defense. This comprehensive protocol freely available from the Defense Technical Information Center demonstrates how to reproducibly and accurately quantify virus concentrations: mPrep/g capsules are used to prepare grids with a mixture of unknown virus and nano-gold particles. Virus counts are obtained using large throughput STEM imaging with automated particle counting. The authors report that this mPrep/g capsule method (in comparison to droplet grid preparation) was much easier, saved technician time, enabled preparation in biocontainment, and provided replicate samples with no increase in effort. And, most importantly, provided a consistent and accurate method for virus quantification. Scanning Transmission Electron Microscopy (STEM) for Accurate Virus Quantification. This proceedings paper and poster presents optimized protocols for ASP-1000 automation of immuno-labeling on grids and for en bloc tissues (pre-embedding). On-grid immuno-labeling is shown with sectioned brain, sectioned HeLa cells, and whole-mount bacteria. En bloc tissue immuno-labeling is shown with mouse brain that is also silver enhanced and then resin embedded using the ASP-1000. The authors discuss how automated labeling fits into the lab workflow by providing a “drastic reduction of hands-on time” from several days to 1-2 hours, by enabling overnight processing, and by eliminating manual specimen and grid transfers that can cause sample damage. Also discussed is that automation increased reproducibility and consistently lowered background labeling noise. This proceedings paper and presented poster shows how the ASP-1000 can accelerate the preparation of TEM pathology tissue specimens from 1-2 days to several hours with conventional chemical reagents. The poster provides automation protocols for the ASP-1000 that accelerate diffusion of processing reagents into specimens by directed fluid flow that is repeated as often as 600 times in just 5 minutes. Examples are provided for multiple tissues including kidney, skeletal muscle, cardiac muscle, liver and brain. The poster also addresses how the automated preparation and mPrep/s specimen capsules and Workstation provide an efficient workflow from specimen acquisition through microtomy that also provides traceability. This proceedings paper presents how the ASP-1000 provides versatility and a workflow solution for research and clinical electron microscopy labs. The authors show the automated preparation of tissues and cell suspensions from laboratory receipt in aldehyde fixative through epoxy and acrylic resin infiltration as quickly as 45.5 minutes for kidney and 2 hours for other tissues. Additional ASP-1000 applications addressed include serial block face SEM specimen preparation, on-grid and en bloc immuno-labeling, and applying gold fiducials to grids for TEM tomography. This work used the mPrep ASP-1000 and mPrep/s capsules to prepare rat gastrocnemius muscle for TEM in order to examine mitochondrial ultrastructure in a study that examines postnatal hyperoxia as a model for premature birth effects on aerobic capacity. Blancett CD, Fetterer DP, Koistinen KA, Morazzani EM, Monninger MK, Piper AE, Kuehl KA, Kearney BJ, Norris SL, Rossi CA, Glass PJ, Sun MG. (2017) Accurate virus quantitation using a Scanning Transmission Electron Microscopy (STEM) detector in a scanning electron microscope. J. Virology Methods. 248:136-144. Blancett and co-authors demonstrate a new method for accurate quantitation of virus particles called STEM-VQ: Scanning Transmission Electron Microscopy - Virus Quantitation. This method uses mPrep/g capsules for virus sample preparation, gold beads for reference counting, high throughput microscopy, and automated software for viral counting. The authors demonstrate high accuracy and reproducibility of the STEM-VQ method in comparison to a standard viral plaque assay and the ViroCyt Virus Counting, while uniquely providing morphology information and the counting of all viruses. Sun MG (2017) Utilization of Capsules for Negative Staining of Viral Samples within Biocontainment. J. Visualized Experiments. (125), e56122, doi:10.3791/56122. McClain and coauthors prepared whole planarian flatworms for serial SEM imaging by developing a rapid automated version of the serial block face SEM protocol developed at the National Center for Microscopy and Imaging Research (NCMIR), which included osmium- thiocarbohydrazide–osmium and lead aspartate staining. With the McClain method, similar results were achieved in just 1.5 days by using rapid automated reagent exchanges with the ASP, compared to 7 days of manual reagent exchanges with the NCMIR protocol. This poster presentation at Microscopy and Microanalysis 2017 also received the 2nd place Diatome Award. Stewart and coauthors demonstrate the automated preparation of kidney, liver, skeletal and cardiac muscle using the mPrep ASP-1000. Reagent processing of kidney was completed in just 45 minutes and liver and muscle in only 2 hours, prior to resin curing. The method provided easy non-messy specimen orientation prior to resin infiltration, and specimens that were only directly handled once - when they were oriented and inserted into labeled mPrep/s capsules. Stewart et al. provides a method for the easy embedding of tissue in LR White resin for TEM immuno-labeling and related applications. The method enables the reliable location of non-osmium treated tissue after embedding, non-messy specimen orientation prior to resin infiltration, minimal specimen handling, and automated reagent processing with the ASP-1000 in less than 45 minutes prior to resin curing. Blancett and co-authors use mPrep/g grid capsules to reproducibly and accurately quantify unknown virus concentrations. Virus suspensions are mixed with a known concentration of nano-gold particles and applied to Formvar-carbon grids using mPrep/g capsules and pipettors. The grids are then imaged with scanning transmission electron microscopy (STEM) followed by automatic image analysis to quantify viral concentration by counting the ratio of viruses to nano-gold particles. They report that mPrep/g preparation improves enumeration accuracy, and that assay results are consistent with virus plaque assays. Using Scanning Transmission Electron Microscopy (STEM) for Accurate Virus Dosing Quantification. This proceedings paper and presented poster demonstrates fully automated immunogold labeling of an endosomal sorting complex in a C. elegans 1-cell stage embryo. The authors report that immunogold labeling using the mPrep ASP-1000 was highly reproducible across numerous samples. This work also demonstrates automated application of gold colloids to thick sections on grids to provide fiducial markers for electron tomography. The authors report that gold fiducial particles were adsorbed evenly over the grid surfaces allowing for highly accurate registration of tilt-series images. 3D cell culture bioreactor systems were assembled with mPrep/s capsules and standard labware. MCF-7 breast cancer cells were cultured for 24 days on 3D collagenous decellularized tissue scaffolds in Prep/s capsules assembled with lab tubing, syringes and pumps. The cancer cells grew into 3D tumor-like structures. Bone marrow derived mesenchymal stem cell pellets were loaded into mPrep/s capsules and grown for 21 days. Pellets grown in mPrep/s bioreactors with continuous flow-through media exhibited a 4-fold increase in the expression of collagen II mRNA, a marker for chondrogensis, in comparison to pellets cultured using mPrep/s capsules as microwell plates. Lyden T, Cole K, Goodman S (2016) Application of a New Miniature Bioreactor System to Generate and Test Artificial Tumor and Normal Breast Ductal Tissues Using MCF-7/MCF10A Cells. Experimental Biology, W282, 1300.18. This poster shows using mPrep/s capsules as micro-bioreactors to grow 3-D artificial tumors from MCF-7 breast cancer tumor cells and normal MCF10A breast ductal tissues on biomimetic extracellular matrix substrates. Cells were grown for up to one month into 4 mm diameter by 1 cm long artificial tissues. The “tissues” were characterized with microscopy and western blots. Shed cells from the artificial tissues were collected from media flowing through mPrep/s bioreactors. Flow cytometry showed that the cancer “tumors” shed about 10x more cells with characteristics consistent of metastatic cells. McClain M. (2016) Bringing Speed and Automation Together with the ASP1000. Microsc. Microanal. 2016. Post deadline poster #49. McClain developed a TEM tissue fixation and embedding protocol that utilized high speed agitation on the ASP-1000 to prepare planarian worm specimens for resin curing that required only 3 hours. The results were comparable to a 7-day embedding protocol that was previously used to prepare these worm specimens. This paper shows how mPrep/g capsules enables easy and reproducible preparation of highly pathogenic viruses for TEM by eliminating grid handling in BSL3-4 biocontainment suites. Examples are shown of negative stained Zaire Ebola virus and murine leukemia virus-like particles. A pictorial diagrams the preparation protocol inside and outside the biocontainment suite. The authors report that the reduced effort, consistent quality, and simultaneous preparation of multiple grids makes this method equally useful for labs working with non-pathogenic viruses. Monninger MK, Nguessan CA, Blancett CD, Kuehl KA, Rossi CA, Olschner SP, Williams PL, Goodman SL, Sun MG. (2016) Improved Virus Specimen Preparation for Transmission Electron Microscopy using mPrep/g Capsules: Applications in BSL3-4 Laboratories. Ft. Detrick Science Fair, 5 May 2016. This poster shows how mPrep/g capsules enable the easy preparation of pathogenic viruses in BSL4 biocontainment. The authors from USAMRIID (US Army Medical Research Institute of Infectious Diseases) prepared Zaire Ebola virus and Chikungunya virus with glutaraldehyde inactivation and negative staining. Samples were also prepared of Ebola nano virus like particles and murine Leukemia virus like particles. Morphology of the viruses and virus like particles were assessed with and without osmium tetroxide vapor inactivation, and with uranyl acetate and phosphotungstic acid negative staining. This study demonstrates how to prepare Ebola virus, chikungunya virus, murine leukemia virus and virus-like particle in BSL3-4 biocontainment suites using mPrep/g capsules. The study also compares virus inactivation using glutaraldehyde fixation prior to grid preparation and using osmium tetroxide vapor treatment after grid preparation. In addition, uranyl acetate and phosphotungstatic acid negative staining are compared. The authors conclude that mPrep/g capsule preparation saves time and effort and produces more consistent high-quality TEM images than manual droplet grid preparation. The study also concludes that uranyl acetate and phosphotungstatic acid staining provide comparable results, and that osmium tetroxide vapor decontamination is faster than glutaraldehyde decontamination but can reduce image quality. This paper and poster provides a guide to selecting grid and support film types for preparing nanoparticles for TEM, and also compares droplet preparation with mPrep ASP-1000 automated processing. The authors concluded that lacey silicon monoxide/Formvar films on 300 mesh grids proved to the be the best for the nanoparticles examined. They also concluded that mPrep automation reduced sample agglomeration thereby allowing for single particle imaging, and this could also be achieved with mPrep/g capsules and manual pipetting. This paper demonstrates how a new lanthanide-based heavy metal stain, when used with mPrep/g capsules, provides high contrast tissue section and negative staining with results that are comparable or possibly superior to conventional uranyl acetate staining. Examples show TEM thin section staining of 5 animal tissues and one plant tissue, and a negative stained TEM bacteriophage specimen. Using mPrep capsules, Goodman prepared two types of pharmaceutical particles for characterization. The mPrep capsules enabled simultaneous and GLP compliant sample preparation. Goodman used mPrep/g capsules to simultaneously prepare 16 grids for TEM from two formulations of siRNA drug delivery nanoparticles with four staining protocols. The grids were then analyzed for morphology and uniformity using TEM. In a separate study he simultaneously embedded four formulations of polymeric drug delivery micro-particles to create eight blocks for cross-sectioning. Thin sections were than analyzed for chemical composition using transmission FTIR and for elemental composition using EDS-SEM. Authors from three institutions prepared animal and plant tissues for TEM. They used mPrep/s capsules for fixation through embedding, and mPrep/g capsules for grid staining. Researches assessed reagent consumption and labor efficiency of mPrep processing compared to traditional processing (using vials, embedding molds and droplet staining). The findings included: mPrep/s specimen processing reduced reagent consumption ten-fold and the number of hands-on operations seven-fold. mPrep/g grid staining reduced hands-on operations six-fold. Jain R, Poyraz AS, Gamliel DP, Valla J, Suib SL, Maric R (2015) Comparative study for low temperature water-gas shift reaction on Pt/ceria catalysts: Role of different ceria supports. Applied Catalysis A: General, 507: 1–13. Jain, et al used mPrep/g capsules to prepare nanoparticle specimens for high resolution TEM characterization. They tested and characterized different Pt on ceria catalyst using XRD, Raman, BET, SEM and TEM. For TEM imaging, the catalysts were deposited onto carbon filmed 300 mesh TEM grids using mPrep/g capsules. Strader and Goodman introduce the mPrep Automated Specimen Processor (ASP), used for simultaneous sample preparation using mPrep capsules. The ASP-1000 prepares TEM and SEM specimens, and stains and labels TEM grids. The paper discusses the ASP-1000 features, including flexibility to efficiently perform routine and complicated tasks. The paper includes pictures of the instrument and examples of heart and skin tissue specimens prepared using mPrep capsule processing. Jain R, Maric R (2014) Synthesis of nano-Pt onto ceria support as catalyst for water–gas shift reaction by Reactive Spray Deposition Technology. Applied Catalysis A: General, 475: 461–468. Jain et al used mPrep/g capsules to prepare nanoparticle specimens for high resolution TEM characterization. They deposited reactive spray synthesized nano-Pt catalysts onto lacy carbon filmed 300 mesh TEM grids in mPrep/g capsules. Goodman S. and Kostrna M (2011). Reducing Reagent Consumption and Improving Efficiency of Specimen Fixation and Embedding, Grid Staining and Archiving using mPrep™ Capsule Processing. Microscopy and Microanalysis, 17 (Suppl. 2) , pp 1174-1175. doi:10.1017/S143192761100674X. This short proceedings paper introduced the mPrep System at Microscopy and Microanalysis 2011. The paper provides an overview of the mPrep System for TEM specimen preparation and TEM grid staining. The System is compared to conventional processing for laboratory efficiency and reagent consumption. This video tutorial demonstrates how to use mPrep capsules with multi-channel pipettors and common lab ware to simultaneously deliver reagents to multiple specimens and grids. The video demonstrates TEM fixation and embedding. Reagent processing procedures are similar for all specimen types and for grids with mPrep capsules . The tutorial starts by introducing the mPrep Workstation. Then it demonstrates how to load and orient specimens into mPrep capsules. Three methods are shown: pinch, compression and cup. This video tutorial shows how to trim and face an embedded block inside an mPrep/s capsule. The capsule is clamped into a microtome chuck for trimming, facing and sectioning. This tutorial demonstrates how to transfer mPrep capsules to a critical point dryer. The transfer is shown with an mPrep CPD holder designed for the Tousimis Samdri. Both mPrep/s and mPrep/g capsules are shown. This webinar introduces and demonstrates the mPrep System. Webinar covers how the mPrep System works. 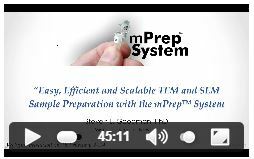 It discusses the benefits of the mPrep System over current practice. And it addresses multiple TEM and SEM applications: tissues, macromolecules, immuno, nanoparticles, cryo-planing. This application note demonstrates the reproducibility of rapid processing with the ASP-1000. Twenty-four (24) specimens from the same aldehyde perfusion fixed liver were prepared for TEM. Specimens were directly handled only once, when they were orientated in mPrep/s capsules. Automated processing required only 133 minutes from post-fix rinse through osmium fixation and 100% resin infiltration. All 24 samples showed well-preserved ultrastructure homogeneity as verified by TEM imaging. This application note demonstrates using agar embedding of suspended cells to enable rapid automated preparation with the ASP-1000 Automated processor to fix, post-fix and embed cells in epoxy for TEM. The example uses yeast, but this method can be readily extended to the preparation of other types of cells in suspension, and for the preparation of other small specimens. By combining agar embedment with ASP-1000 processing, 18 centrifugation and resuspension cycles were eliminated from a typical manual protocol. Once the cells were agar embedded, the total processing time prior to epoxy resin curing was just 1.5 hours. This application note presents a method for processing mammalian muscle tissue for TEM in just over two hours. Using the ASP-1000 automated specimen processor, specimens were processed from postfixation rinse through infiltration in just 133 minutes. Specimens were handled only once, when they were oriented and inserted into mPrep/s capsules using the mPrep/s Workstation. This application note presents a fast, fully-automated method of tissue processing. Mammalian kidney was prepared for TEM with the mPrep ASP-1000 programmed for highly efficient rapid-agitation. Reagent processing from postfix rinse through 100% resin infiltration was accomplished in just 45 minutes. This brief technical note illustrates automation of immunogold labeling using the mPrep ASP-1000 automated specimen processor. Researchers at the University of Wisconsin prepared C. elegans tissue sections on TEM grids and then used the ASP-1000 to immunolabel an endosomal sorting component with 6 nm gold. The entire 7.5 hour immunolabeling protocol was automatically accomplished. This note also illustrates automated application of 10 nm gold fiducial markers onto thick sections for tomography. This application note illustrates mammalian kidney tissue prep for TEM from fixation through embedding. This general protocol applies to other specimens that require embedding for cross-sectioning. Photos show the mPrep capsule reagent exchange process and how mPrep TEM blocks are faced and sectioned while still in capsules. Supplies and the reagent formulae are listed. This application note illustrates staining tissue sections on TEM grids using mPrep/g capsules with pipettors and common lab supplies. The protocol shows uranyl acetate and lead citrate staining of kidney and brain sections, although the methods apply to other grid staining procedures. Required supplies and the reagent formulae are listed. This application note illustrates the preparation of macromolecular specimens for negative stain TEM using mPrep/g capsules, pipettors and Formvar®-filmed TEM grids. The example is a DNA-RecA complex, although the protocol is applicable to many other specimens. The specimen preparation and microscopy was performed in the Department of Biochemistry at the University of Wisconsin – Madison by Mr. Jay Campbell and Dr. Sindhu Chitteni-Pattu, in the laboratory of Dr. Michael M Cox. This illustrated protocol shows the preparation of nanoparticle specimens for negative stain TEM using Formvar®-filmed grids in mPrep/g capsules. Eight different formulations of ~100 nm drug delivery particles were prepared simultaneously for a pharmaceutical company to evaluate structure and uniformity. This general sample preparation method can be applied to other nano-scale specimens including nano-fibers and viruses. This application note illustrates the preparation of polymer specimens for cross-sectional analysis. Polymer drug delivery particles were embedded and cross-sectioned for transmission FTIR spectroscopy and EDS-SEM. The application note also shows how to extend these methods to the preparation of other soft materials including coatings, thin films and fibers. This application note shows the negative stain TEM preparation of pathogenic Ebola virus in high containment BSL4 labs. Scientists used mPrep/g capsules to eliminate grid handling in the BSL suite. This resulted in easier, safer processing and more reproducible sample preparation. Specimen preparation and microscopy were performed by the US Army Medical Research Institute of Infectious Diseases (USAMRIID) Pathology Division, at Ft. Detrick, MD. A graphical display illustrating how to load grids into mPrep/g capsules, and how to use pipettors to stain or label grids. Use this guide as a lab reference poster. Instructions for using mPrep/g capsules for staining sections on grids with uranyl acetate and lead citrate. A graphical display that illustrates how to easily prepare virus specimens for negative stain TEM in Biological Safety Level 3-4, and other laboratories. Use this guide as a lab reference poster. Instructions for using mPrep/g capsules for grid handling and processing. A single page graphical display of the three steps to insert specimens into mPrep/s capsules using the mPrep/s insertion tool. Use this guide as a lab reference poster. A single page graphical display of the three steps to orient and load specimens into mPrep/s capsules. Both compression and pinch methods are shown. Use this guide as a lab reference poster. Instructions for using mPrep/s capsules for specimen handling and processing. Print this 96-well plate template to organize protocols into columns and rows with a microtiter 96-well plate. This technical note introduces using mPrep capsule labeling for tracking specimens and grids with a data management system. Topics addressed include mPrep labels, 2D datamatrix barcodes, barcode readers and laboratory information management systems. How to use the mPrep CPD holder for specimen and grid sample preparation using the critical point method. Instructions for using the mPrep capsule grid box for storage and labeling of mPrep/g and mPrep/s capsules.